I will continue to do this each week even though the majority who asked for it to come back, don't participate. Yes. I suppose I am. Hey, it's what I do best. If you want to play, it's REALLY simple and fast, you can find out how HERE. Also, I am doing away with Mr. Linky. He never seems to be working right, so if you join us, leave it in the comments so we can all go visit yours. Sooooo .... here are mine for the week. Come on ... play along. It's so easy and fun. When you do ... leave your comment below with a URL to your Pay It Forward blog post ... so we can come visit your links. The week is not quite over yet, which means we are still playing "favorites". Right? Well, it's also time for Pay It Forward Friday. So, I'm sure you know what I'm going to say. But just because you think you're some smartypants, I'd read on JUST TO MAKE SURE. M'Kay? We WILL be playing Pay It Forward Friday this week,but a little bit different today than in the past. Rather than moving from blog to blog ... you're only going to list ONE blog. And guess which blog that would be? Did you guess YOUR FAVORITE BLOG? Sorry ... You can't pick my blog. I mean, I know MINE is your favorite. So you'll have to pick your second FAVORITE blog and post about it. I know many will be tempted to list more than one because you don't want to hurt anyone's feelings, but seriously people ... ONE STINKIN' BLOG, okay? ONE! Your second favorite at this time. Please be sure to link to this post on your blog, then come back here and sign Mr. Linky. I hope so ... because you HAVE TO DO IT, REMEMBER? Dang ... Mr. Linky isn't working. It was! Now it's gone. So, if it's there ... you can sign it. If it's not, just leave a comment. That way we can all we can all go and visit. Hang in there ... this is the last day of this obligation to the favorites thing. Geez! So - enough about you ... on to me. So there ya go ... Karly? ... the pressure is on now. You have to make all my fabulous readers roll around on the floor in stitches ... each and every time they come to visit you. Your turn. Who do you love seeing light up in your reader right now? And remember ... YOU HAVE TO PLAY! It's a requirement as a reader of this blog. Wanna play ... or do you just want to sit there gawking? I'm playing so here I go. and tell them you found them via An Iowa Mom. I mean, come on ... spread the word about Pay It Forward Friday ... it's the least you could do. Well ... not really ... you COULD play. Wanna? 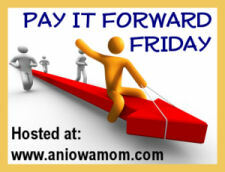 Tomorrow is PAY IT FORWARD FRIDAY. It's a lot fun. You should REALLY participate. It sounds difficult and confusing ... but it's NOT. If I can do it ... my cat sitting here licking himself could do it ... which means you could do it. Seriously people. It's THAT easy. Here we are back at Pay It Forward Friday. The rules SOUND difficult, but really ... if you just work through the steps it's VERY simple and it was fun. 1. Life Unscripted - I've bee reading Erin for a long time. I have never met her, but she is from the town I graduated high school. It's fun to see places in the backgrounds of her photos that look familiar. 2. Dirty Little Secret - A new addition has just arrived. Congratulations are in order. 3. Mommy Wants Vodka - A list is revealed for all parents of things they DO NOT need to buy before a new baby arrives. That was fun. However, kinda scary in my case ... every single one of the three blogs I landed on ... had talk of new babies. Is that some sort of sign? NO! Absolutely not. There is no way. WOW - I did not realize that so many of you enjoyed "Pay It Forward Friday" that much. So, back by popular demand ... I bring you PAY IT FORWARD FRIDAY ... Revised. It seems the previous PIFF was too complicated to work like it was designed. And whose fault is that? Good God, I'm just kidding ... it's MY fault. Okay? I said it. I take full responsibility. It just wasn't simple enough to attract others to participate. 1. Visit a BLOG from YOUR blog roll. - Comment on one post on the first page of the blog, telling them you are participating in Pay It Forward Friday with a link back here to the rules (this post). 2. From that site, click on a blog from THEIR blog roll. If they don't have a blog roll, visit one of their commenter's links. - Again, comment on one post on the first page of the blog, telling them you are participating in Pay It Forward Friday with a link back here to the rules (this post). 3. From THAT site, click on a blog from THEIR blog roll. Repeat above. Then, come back to YOUR blog and post, linking to each blog you visited and if you'd like you can share a little bit about them. Come To An Iowa Mom ... sign Mr. Linky and link to YOUR post that lists the three blogs you visited and commented on. This will be some great reading when blog posting is slow over the weekend. What an awesome way to discover new blogs ... basically recommended by "friends". Mr. Linky will be up first thing in the morning. Well ... here we are at Friday again. Geez, time goes by so fast. Last week was the 4th, so I let PIFF pass. And I'm sure that was okay with you all. But this week ... NOT! Here's Mine ... WHERE IS YOURS? Title Of Blog I Would Like To Feature Is: Heidi Jo - What Do I Know? I Like This Blog Because: From the moment I discovered her blog, I loved it. And when I commented and she replied, I loved her even more than her blog. She's real. She's fun. She's a wife. She's a mom. She's a friend ... that I've never met in person ... but know that I will, someday. And then, I'll love her even more. Be sure to come back and check out each and every one of the awesome blogs listed by our participants below. Have Fun! And when you comment on their blogs, be sure to let them know how you found them. At An Iowa Mom.